Lyubov Erofeeva, the head of the Russian Family Planning Association, spoke to Russia Today on the efforts to solve demographic problems in Russia. Russia Today: Some countries are battling to slow down the rapidly growing birth rate, while in Russia we are doing everything possible to keep it up. How successful have the authorities been so far? Lyubov Erofeeva: I should say that the non-governmental sector could play a serious role in this policy development. You are absolutely right, some countries are more interested in planning their families, in decreasing their birth rate. However, in Russia we have a different situation. The demographic situation can be described as a crisis. And this crisis goes on not because of the rather low birth rate, which is completely the same as in the most of industrial countries of Europe. The most dangerous feature of our demographic crisis is of course the mortality rate, especially the mortality rate among men. The historical, economical disturbances, all those revolutions we have experienced, have negatively affected the health and well-being of Russia’s people. RT: Men in particular, not women? L.Y. : Women as well, but the life expectancy of women is a bit higher. Women in Russia are living for 72-73 years on average, while men live usually not more than 60 years. These are surely the negative results of revolutions, the crisis of economical and the social spheres. So talking about the birth rate itself, the government could of course use the pro-natal approach in an attempt to balance the demographic situation in Russia, and could develop a policy to attract the attention of families to start growing faster and faster. But many countries have already traversed this path. They are showing us that the attempts the government is doing now will give results only in 10-15 years. So, keeping the demographic situation in control is a slow process. RT: So, you believe that the high mortality rate of the men is actually the main factor which influences the low birth rate in Russia? RT: What can be done to combat that in order to help young families to have more children? L.Y. : Let’s divide your question in two parts. First of all, the reproductive potential of the Russian population is not so bad, the procreative features are not so bad. The major challenge, the major problem we can foresee is the decision of women – to deliver or not to deliver. This shows their feeling insecure of the social situation; this shows their feeling insecure of their families, because the traditional family relationships are changing in the modern world. I think that the birth rate is not that bad in Russia. The problem is that women are postponing the second and the third deliveries. They are planning to have two or three children, but they don’t have enough financial support, from the government as well. They do not have the full understanding of their families, of their husbands to deliver that second or third child. So the problem is in having the second and third kid, not the first one. Everything is ok with having the first-born in Russia. 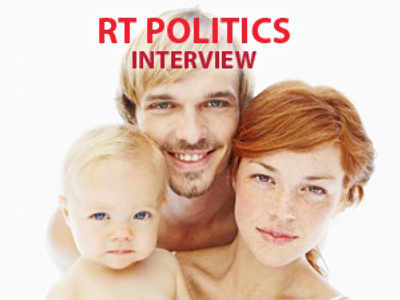 RT: So, the birth rate situation is not as catastrophic as it may seem in Russia, and we’ll see the results of the governmental support, we just have to wait for some time. L.Y. : Yes, and since the demographers say that it is the process which cannot be pushed up too much, we need to wait for some time for the seeds to grow.